Senator Dino Melaye Not Ready For Police Questioning. See Why. 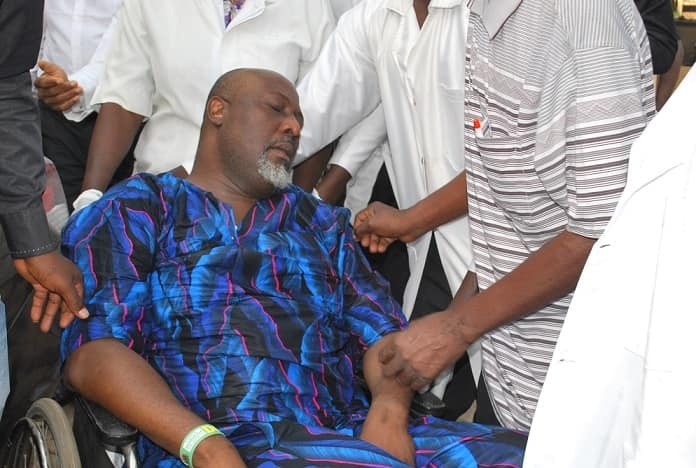 While The Police may be satisfied that it now has in its custody, embattled Senator Dino Melaye, he is yet to show any sign of health since he collapsed in their hands two days ago. The police on Friday acknowledged that controversial senator, Dino Melaye, has surrendered days after the police laid siege to his house in Abuja. The police laid siege to Mr Melaye’s house for eight days as the lawmaker allegedly refused to appear before the police for questioning. He is wanted for his alleged role in the shooting of a police officer who is still in the hospital, the police said. Authorities say the embattled Senator is pretending to be ill. Police spokesman, Jimoh Moshood says all tests conducted on the Senator proved negative. Naija News recalls that the senator had slumped while leaving his residence to enter the police vehicle after which he was aided to entering the office of the federal special anti-robbery squad (FSARS). The senator had refused to surrender to the police following attempts by the police to arrest him for a case of criminal conspiracy and attempted culpable homicide committed on 19 July, 2018.